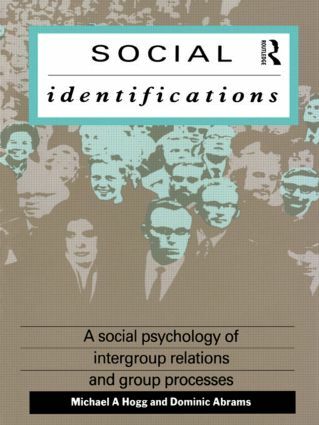 The authors of Social Identifications set out to make accessible to students of social psychology the social identity approach developed by Henri Tajfel, John Turner, and their colleagues in Bristol during the 1970s and 1980s. Michael Hogg and Dominic Abrams give a comprehensive and readable account of social identity theory as well as setting it in the context of other approaches and perspectives in the psychology of intergroup relations. They look at the way people derive their identity from the social groups to which they belong, and the consequences for their feelings, thoughts, and behaviour of psychologically belonging to a group. They go on to examine the relationship between the individual and society in the context of a discussion of discrimination, stereotyping and intergroup relations, conformity and social influence, cohesiveness and intragoup solidariy, language and ethnic group relations, and collective behaviour. Social Identifications fills a gap in the literature available to students of social psychology. The authors' presentation of social identity theory in a complete and integrated form and the extensive references and suggestions for further reading they provide will make this an essential source book for social psychologists and other social scientists looking at group behaviour.